Some people just always seem to have a clean home. Admittedly, I’m not one of those people, but I’m trying to be. What do they know that the rest of us don’t? Do they spend hours each day obsessively cleaning their homes? I’ve SCOURED the globe (AKA: asked all of my tidy friends for their secrets), and have come up with this list of 16 things people with clean houses do every day. People with clean houses do not let clutter pile up. They attack it with a vengeance. Out of all of the things people with clean houses do every day, this one is by far the most important. Because no one wants to move piles of crap every time they want to clean their home. Seriously, once I became a minimalist, cleaning my home became exponentially easier! Even if you have no desire to become a minimalist, you can still make your home appear cleaner simply by removing clutter. Start by clearing the surfaces, then the floors, and finally work on the storage areas in your home. This is a tough one in our house. With teenage and pre-teen boys (and their endless parade of friends), dishes are CONSTANTLY being dirtied. In fact, I’ve found that the only time we are able to completely empty our sink is to have my oldest son do the dishes before he goes to bed at night. I can’t tell you how happy it makes me feel when I wake up to an empty sink in the morning. Unfortunately, this blissful feeling only lasts for about 5 minutes, because my youngest son is an early riser and likes to eat his (3-course) breakfast ASAP. This is something I am a tad bit obsessive about. My husband, on the other hand, is not. If I had to count the number of times per day that I wipe down my kitchen and bathroom countertops, I’d probably wind up somewhere between 50-200 times a day. (Yes, I know this isn’t ‘normal’ and yes I do buy Clorox disinfecting wipes in bulk). If I counted the number of times my husband cleaned the countertops daily, I’d have to stop at…zero. Case in point: this past winter, I was sick with the flu for over a week. My dear, sweet husband took on the role of cooking and ‘cleaning’ while I was out of commission. At the end of the week, I emerged from my flu-stupor to discover ‘growths’ on the surfaces of my kitchen counters. Our once smooth dining room table had mysteriously developed a rough texture. It was almost enough to send me back to bed for another week! For the record, I don’t think there is a ‘right’ number of times to wipe down your countertops each day…just as long as you do it more than my husband! 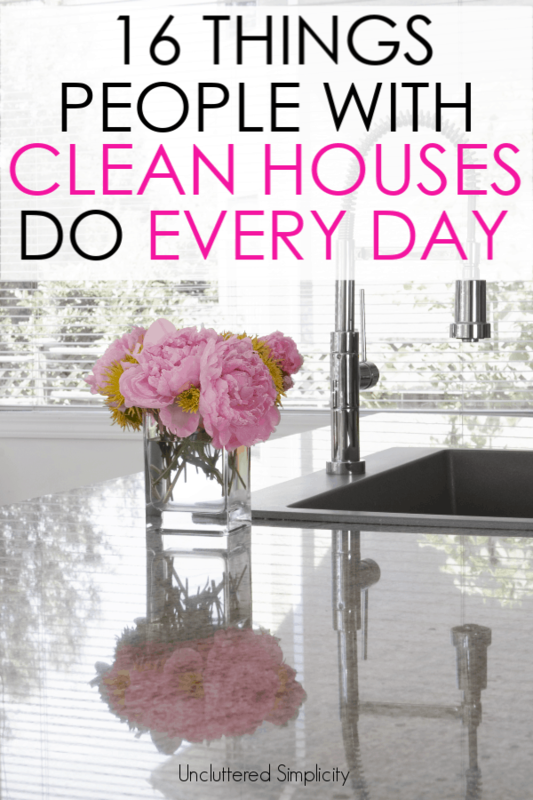 Want to check a ridiculously easy cleaning win off your list every day? It’s easy…just make your bed. When your bed is made your bedroom appears instantly clean and organized. (Even if you have piles of clothes strewn all over your floor). Making your bed in the morning (or whenever you get up) also increases productivity, lowers stress, and helps you make better decisions throughout the day. Don’t believe me? Here are 24 reasons you should make your bed every day. The ‘one-touch rule’ of cleaning states that if you touch something, you put it where it belongs. You don’t leave your coat on the chair near the closet…you hang it in the closet. You don’t leave your dirty clothes on the floor at the foot of the bed, you…wait for it…put them in the hamper. Incorporating the one-touch rule will save you time, (think: no more wasting time shuffling things around), which you can then use to scrub your toilets. With our family of five, the only way I have been able to stay on top of laundry is by doing a load each and every day. With the exception of Sundays, because sometimes Mama just needs to binge watch whatever’s trending on Netflix. You may find that doing a load (or two) of laundry is unnecessary due to your family size and/or clothing needs, and that’s totally fine. As long as you have a basic system in place for keeping up with the laundry. You do you! Oh, and if you have kids who are old enough to know better than to eat the Tide Pods, teach them how to do their own laundry. Think just doing a load of laundry a day is enough to keep a clean home? Nope. Turns out you (and your kids) actually have to put that load of laundry away! One key thing people with clean houses do every day is to clean up messes as they happen. They don’t wait for the spilled milk to turn into cottage cheese. (Eww). Instead, they grab a paper towel and wipe it up right away. If they see their 3-year old missed the toilet seat (again), they grab a disinfecting wipe and take care of it. They don’t wait until Friday (because Friday is bathroom cleaning day) to deal with it. People with clean houses are list-makers. They have a home management binder (or better yet, a cleaning binder) and they aren’t afraid to use it. Checklists and cleaning schedules are their best friends. They always know which cleaning supplies they are running low on as well as where they are all located. BTW: This book has been a game-changer when it comes to setting (and keeping) a cleaning schedule in my home. The best thing is, it takes just 10 minutes a day! I’m really not sure how I survived 40+ years without it! You can skip this point and read it later if you want! Seriously, though. People with clean houses don’t procrastinate. AKA: they don’t wait until winter comes to clean their gutters. Not that I’m speaking from experience or anything. Whether you choose to clean one room (bedroom), one zone (upper level), or one category (floors) at a time, the trick to keeping a clean home is to focus and stay on task. This is an area where so many of us struggle. People with clean houses are typically good at avoiding distractions. Notice I didn’t say they don’t have distractions…everyone does. They’ve just mastered the art of dealing with interruptions quickly while simultaneously staying focused on the task at hand. Because goodness knows, as soon as you break out the vacuum, the toddler will need a drink, nap, diaper change (or all three). The doorbell/phone will ring. You’ll spot something else to clean. It happens to us all. People with clean houses use simple tools and simple cleaning methods in order to keep their homes looking squeaky clean. They aren’t trying to reinvent the wheel when it comes to keeping a clean house. They know that they can clean their entire house with a handful of supplies, minimal effort, and in just 10 minutes a day. For them, cleaning isn’t a chore. It’s simply part of their daily routine. I remember years ago when the Flylady burst onto the scene. Ready to revolutionize the way I cleaned, I quickly signed up for her cleaning schedule. I was so excited…until I opened that first email and it said…how to shine your sink. What!? I wanted to know how to create a schedule to clean my entire house and she told me to shine my sink? What’s worse…she wanted me to do it…Every. Single. Day. I thought she was off her rocker. Then I tried it. Surprisingly, doing this one simple task (when added to a few other small tasks) really did end up revolutionizing the way I cleaned my home. Not surprisingly, clean people are also (generally) organized people. They instinctively know that everything they own should ‘live’ somewhere. They are “A place for everything and everything in its place” people. People with clean houses despise paper clutter. They would rather be strung up by their toenails than spend an entire Saturday afternoon sorting paper. Which is why so many people with clean homes (like me) have gone completely or even semi-paperless. This is the course I used which help me go (almost) entirely paperless. This is a habit I have adopted over the years and it really has made a shocking difference in the overall cleanliness of our home. Before I leave a room, I quickly glance around and see if there is at least one thing I can take with me into the next room. For example, if I am leaving the living room and heading into the kitchen, I’ll grab whatever snack dishes happen to be on the coffee table. If I am on my way upstairs, I quickly snag any stray legos to drop off in my son’s room. Doing this simple step takes almost no time and helps keep our home relatively tidy.